I discovered my love for Chicken Milanese on a recent trip to New York City. I was visiting my dear friend Kelly and we went to one of our favorite spots for lunch– Serafina. I usually never stray from my standard order: a mimosa (or two) and the Serafina Chicken Salad with sundried tomatoes and pesto dressing. It is salad perfection. i actually developed my own copycat version of this dish, which I will post at a later date. On this particular occasion we were in the mood for a mid-afternoon feast and instead ordered a smorgasbord of entrees. Sometimes we get carried away…gluttony at its finest. One of those dishes was Chicken Milanese. Now, if you told me that you were going to make me breaded, fried chicken cutlets for dinner I would give you a smirk and inwardly cry with disappointment. I find that meats, vegetables, etc. dredged breacrumbs all taste the same. If I made breaded veal I could probably trick my “no red meat” friends into thinking it was poultry. How do you pronounce Milanese anyway? Is it MIL-UH-NAISE, MEE-LAW-NAISE, MIL-LAW-NAY-SAY? If I had an Italian speaking friend I would ask them. Whatever the correct pronunciation is, let me just say that if you do it right it’s the bomb. It needs to be crispy, but not overdone. Fried (or in this case baked), but not too greasy. You also need to add plenty of spice to your breadcrumb mixture. The standard way to make Milanese is to dredge in flour, egg and breadcrumbs then fry in loads of butter. I wanted a healthier alternative tonight so I opted for olive oil and lemon juice dredge then a bread crumb/ parmesan crust. The chicken was then baked. 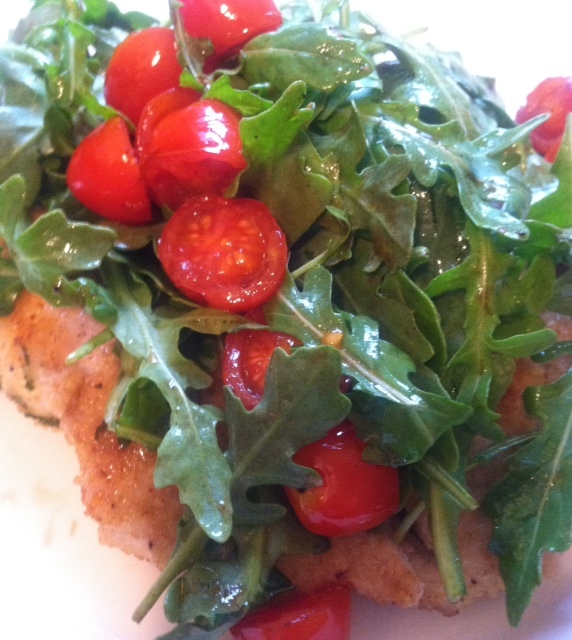 Instead of pasta I chose to top my cutlets with a simple cherry tomato and arugula salad with balsamic vinaigrette. The result was fabulous. Preheat oven to 450. Put chicken cutlets between 2 paper towels and pound until very thin! If you don’t own a mallet, you can use the bottom of a coffee cup. Combine olive oil, lemon juice and pepper in one bowl. Combine breadcrumbs and parmesan in another. Dredge chicken cutlets in olive oil/ lemon mixture, then in breadcrumb/ parmesan mixture. Make sure that breadcrumbs cover chicken evenly and pat down. Bake chicken breasts on a greased cookie sheet for 15-17 minutes, flipping chicken halfway through. In the last minute, turn the oven on broil to make it extra crispy. While the chicken is baking you can assemble the salad. Whisk together the balsamic, olive oil, salt and pepper. Slice the cherry tomatoes and basil. Toss the arugula, tomatoes and basil with the dressing. I actually sauteed my cherry tomatoes in a bit of olive oil prior to tossing with dressing and arugula, but it’s up to you if you want them cooked or not. Remove chicken from oven and squeeze a lemon wedge on the chicken. To serve, top the chicken cutlets with the tomato/ arugula salad. Oh Yum….. I have heard of that restaurant in NYC… want to go there sometime!! !